This month Bristol Museum invited me to run a Japanese Woodblock Printing workshop as part of their Family Fun Japan Day to tie-in with their Masters of Japanese Prints - Life in the City exhibition. I carved and printed a netsuke frog last March from sketches I made at Bristol Museum archives. 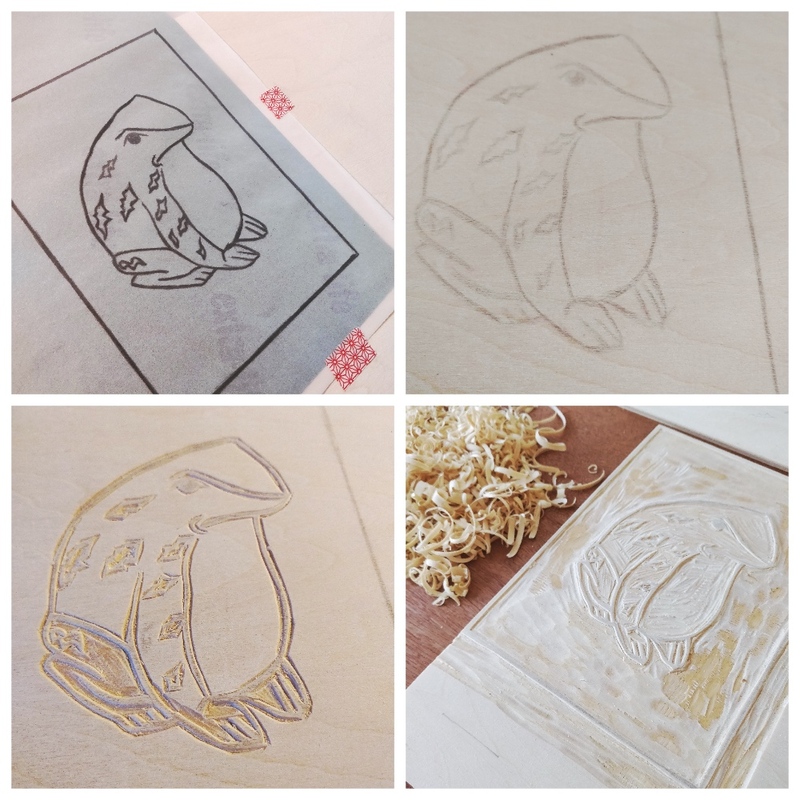 Using the same sketch, I simplified the design and transferred the image to woodblocks made from Japanese plywood. I carved 1 key block and 4 colour blocks from the same design in preparation for a multi-colour woodblock print. In Japan during the Edo period, a Japanese woodblock print required many stages, and highly skilled craftspeople to produce an edition of high quality colour prints. Many blocks were used in the process just for one edition of prints. You can see the 17 stages of a colour woodblock print for a design by Toshusai Sharaku (active 1794-95) currently on show at Bristol Museum's Japanese Prints Exhibition - Life in the City. These reproductions were printed by Nagao workshop in Tokyo around 1985-2017. Frog design simplified from netsuke frog sketch at Bristol Museum archives. Image for key block transferred and carved into Japanese plywood. Colour blocks carved and almost ready to test for printing. Waiting for new chisel to arrive to complete the kento registration! Inking up the blocks to test out prints for 5 stages of a multi-colour woodblock print using Japanese carbon ink for the key block and gouche for the 4 colour blocks. I’ll be posting some pics from the event to my instagram page @eightfivepress so keep an eye out! I mentioned a few months ago that I was going to be taking part in ‘Printmaker - An Encyclopedia of Inspiration’ by Janine Vangool (Uppercase Magazine). The book is available from Uppercase website, it is also now available in the UK. If you’re in Bristol you can also pick up a copy from Arnofini bookshop. Kate Newnham has curated another stunning set of Japanese woodblock prints for the latest exhibiton ‘Masters of Japanese Prints: Life In The City’ at Bristol Museum. I arrive early to the museum on the day of opening and already there’s steady stream of people who have been transported into 18th Century Japan - a corridor abundant with tatami mats and sliding doors, scroll paintings and ikebana, 3 stringed lutes and tea ceremonies, calligraphy and poetry, parasols and lanterns, music and dancing. A rich world of theatre, fashion and festivals, temples and shrines. I study a print by Kitagawa Utamaro ‘Fishing Boats with Nets under Ryogoku Bridge 1790.’ A young man next to me also absorbed in the detail turns to me with a look of amazement and starts the conversation. We look at a print together, in awe of the craftspeople who have been involved in the making of this scene. How is it possible to carve and print such fine and intricate works of art? The complex textile patterns on the kimonos, the fine string on the fishing nets, the delicate outlines of the waves, the distant crowd of people on the bridge under parasols, so tiny yet such clarity and attention to detail. We stand in wonderment for a few minutes and then slowly go our separate ways to explore further curiosities of this Floating World. Being a lover of green tea and music, I am drawn to the festive Eating and Drinking prints of Katsukawa Shunshō, Kubo Shunman. I zoom in on a woman playing a Shamisen on a tea house balcony. She is surrounded by little bowls and cups filled with sake and a lacquer box which may contain sushi or green tea powder. This is just a small detail of the print. A couple of women to the right are holding a book but seem to be more interested in what is going on at the other side of the balcony. On the oppostie side of the corridor are prints of Geisha and courtesans. Again the photos here are closeup snapshots from a bigger story. These prints remind me of a poem by Amy Lowell. Stretching along the rest of the corridor are prints depicting actors from Kabuki theatre. I take a few closeup shots of actors by Katsukawa Shunsho. Woodblock prints of actors, pop icons from the Edo period, were popular souvenirs from the Kabuki theatres. It takes me back to my teens with posters of celebrities blue-tacked to my wall. I would come home after a concert wearing a new t.shirt printed with the band’s logo or portrait of my favourite pop star! The detail of the crowd in the lower right corner shows an audience at the theatre. This is a small section from a large scale woodblock print in the exhibition. It’s made up of four prints. At the top, we are given a glimpse backstage with the actors ready to go on stage, then the main stage with the actors playing their parts, the next part shows the audience and staff selling refreshments and below that are people hanging out on the street outside the theatre. When I was 16 my first work experience was helping the sound engineer at a local theatre. I could sit up in the sound booth or at the back of the theatre while the actors rehearsed their parts. I was introduced to all the different elements that make this make believe world come alive. I explored the whole place from backstage, on stage, trying out different seats in the auditorium, to running back and forth between the theatre and the cafe delivering messages or drinks. I was fascinated with how it all worked and this print is a brilliant insight to the different aspects of a theatre and the people who make this remarkable enchanting world. 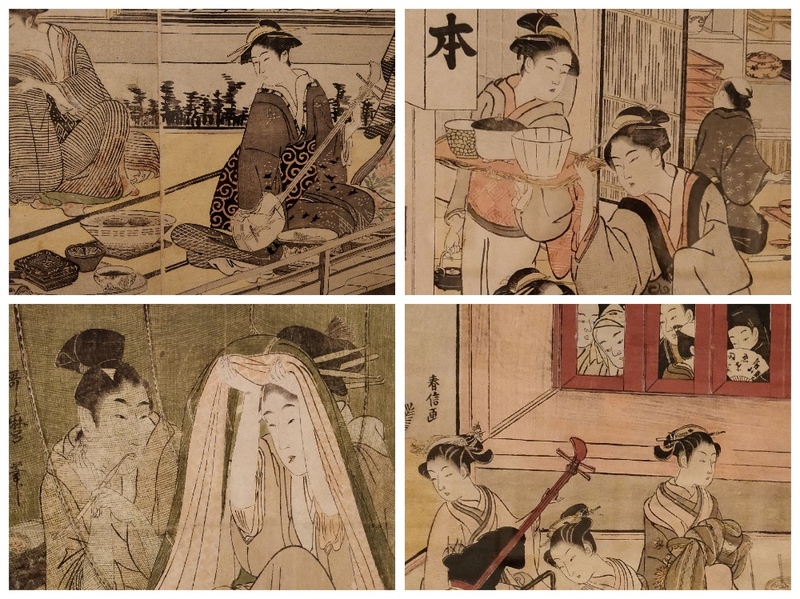 “This set of four prints shows the interior and exterior of the Imchimura theatre, one of the main theatres licensed by the government in Edo (Tokyo).” Bristol Museum (On loan from Kimono Kimono). There are so many beautiful prints to explore here that one viewing is not enough. I’ll be back again to stop a little longer. To look a little closer. To step back into this hypnotic magical floating world of 18th Century Japan. Kate Newnham will be giving a lunchtime talk about the exhibition at Bristol Museum Thursday 7th February from 1.15pm - 2pm. Uppercase magazine’s founder, publisher, editor and designer Janine Vangool launches the next volume from her Encyclopedia of Inspiration - Print/Maker. I am thrilled to be a part of this volume which will be available this month. I discovered Janine Vangool’s magazine, Uppercase in 2012, the same year I bought my Adana 8 x 5 printing press. It was Uppercase issue 12. A beautifully designed magazine full of inspirational articles from the ephemera of newsprint, artist’s sketchbooks, creative explorations with maps, Japanese papermaking, a celebration of vintage cameras to sailing the Arctic Circle and letterpress printing from a campervan! I was hooked! 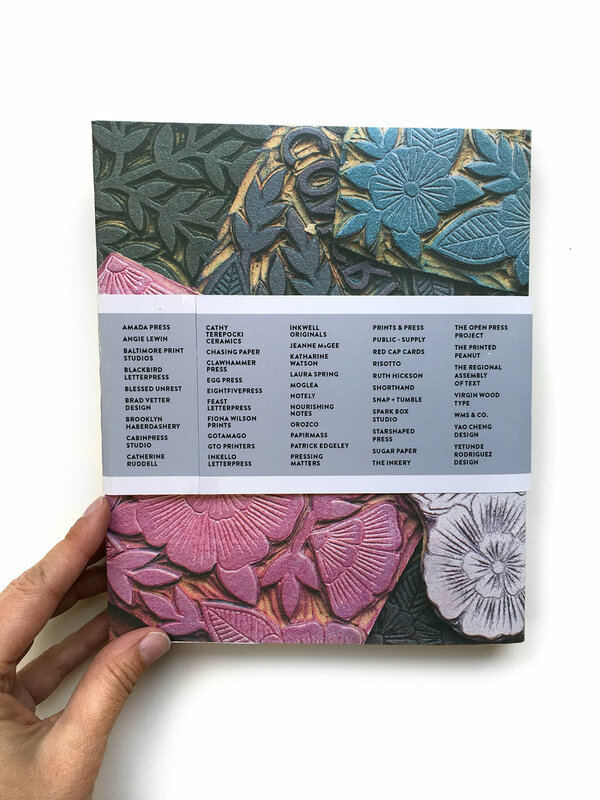 As I was beginning my own printmaking journey, Uppercase opened a door to a world of possibility and adventure, fantastic resources and a connection to artists from many parts of the globe. So it’s really lovely to be invited by Janine to take part in the next volume for The Encyclopedia of Inspiration - Print/Maker. Like Uppercase it will be packed with a colourful eclectic mix of playful and creative printing explorations. I look forward to getting my copy and I hope you are inspired to get one too! The 48 artists featuring in Print/Maker include Amada Press, Angie Lewn, Baltimore Print Studios, Blackbird Letterpress, Brad Vetter Design, Brooklyn Haberdashery, Cabinpress Studio, Catherine Ruddell, Cathy Terepoki Ceramics, Chasing Paper, Clawhammer Press, Egg Press, Eightfivepress, Feast Letterpress, Fiona Wilson Prints, Gotamago, GTO Printers, Inkello Letterpress, Inkwell Originals, Jeanne McGee, Katharine Watson, Laura Spring, Moglea, Notely, Nourishing Notes, Orozco, Papirmas, Patrick Edgeley, Pressing Matters, Prints & Press, Public-Supply, Red Cap Cards, Risotto, Ruth Hickson, Shorthand, Snap + Tumble, Spark Box Studio, Star Shaped Press, Sugar Paper, The Inkery, The Open Press Project, The Printed Peanut, The Regional Assembly of Text, Virgin Wood Type, WMS & Co., Yao Cheng Design and Yetunde Rodriguez Design. 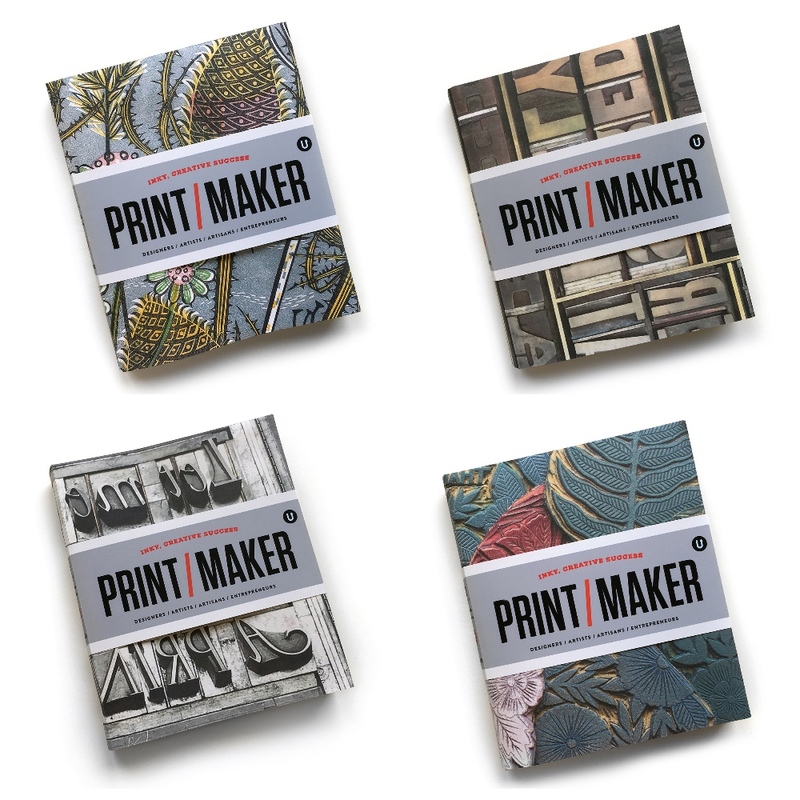 You can pre-order Print/Maker from Uppercase website by clicking on the button below. The next three volumes from The Encyclopedia of Inspiration include Ephemera, Vintage Life and Quilted. Over the August bank holiday weekend I was invited to run print workshops at Wiltshire Creative's 'Lift Off!’ Festival at Salisbury Arts Centre. The people of Salisbury certainly did reclaim the streets and Salisbury Arts Centre too! The city was buzzing and people were in great spirits. Here are just a few of the pics of printing explorations over the busy weekend. Ben stamps his name and creates buildings from pre-carved stamps while the adults have a go at carving shapes and patterns to create their own stamps. Type setting names and rubber stamping fun! Together Freya and Ewan type-set and print their names while little hands find spongy stamps to explore and play! 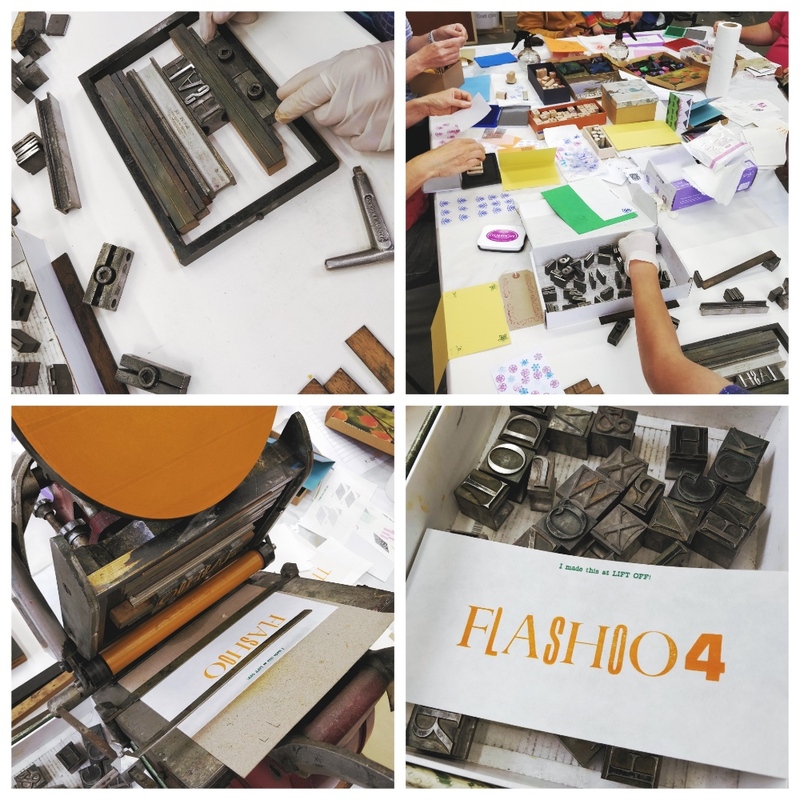 Flashy Letterpress & Rubber stamps! Thanks to all who took part over the weekend! It was fab! Thanks to my wonderful friend Patrick who helped me hang my woodblock prints for the North Art Gallery Summer Show. Thanks also to Adrian for curating the event. The preview was fab and the show will be up for 4 week so do pop in and say hello! £5 from the sale of each print will be donated to Save The Elephants. Through my interest in Japanese antique netsuke, I have become more aware of the ivory trade that is still in operation today. Save The Elephants are a founding partner of the Wildlife Conservation Network in the US which transmits 100% of donated funds to the field. "Our mission: to secure a future for elephants and to sustain the beauty and ecological integrity of the places they live; to promote man’s delight in their intelligence and the diversity of their world, and to develop a tolerant relationship between the two species." Save The Elephants continue their research to find solutions to reduce conflict, end poaching, trafficking and the demand for ivory. They raise awareness and provide internships and scholarships in conservation education. This book was the inspiration for my journey into the wood. Each woodblock is hand printed with a baren using Japanese carbon ink on white hosho paper. The description 'NETSUKE’ is debossed with 10pt New Clarendon metal type printed on the adana 8 x 5 printing press. The space invites you to take a quiet moment and sit on the cushion provided and read from the book if you wish. There are also hand printed bookmarks for you to take away. Show Miche Watkins, Tina Altwegg, Gareth Pitt, Sarah V Penrose, Ian Pillidge, Jane Warring, Jess Stevenson, David Brown, Tony Eastman, Victoria Fox, Ian Usher, Caroline McGlone, Lenny, Andrew Wilson and Luz Gallardo-Franco.